Armenians are gearing up for their New Year’s parties. Shopping is still in full swing and will continue to be until the end of the day. 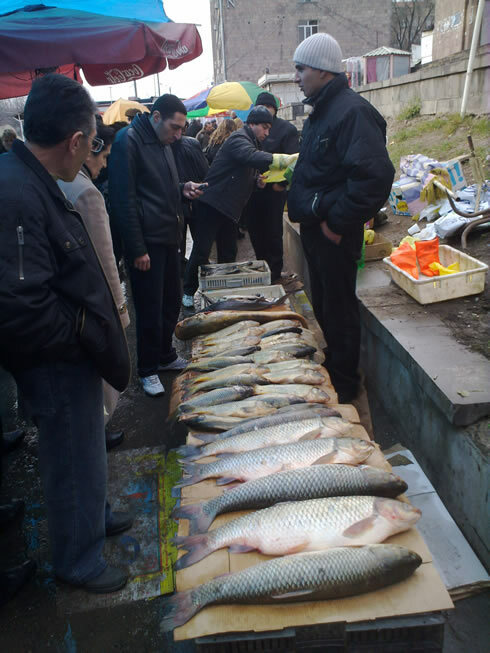 The Gomidas market is full of provisions of all kinds, including chickens wrapped in cellophane and live carp, sturgeon and trout being sold directly on the sidewalks as people struggle to pass by, often rubbing against one another. 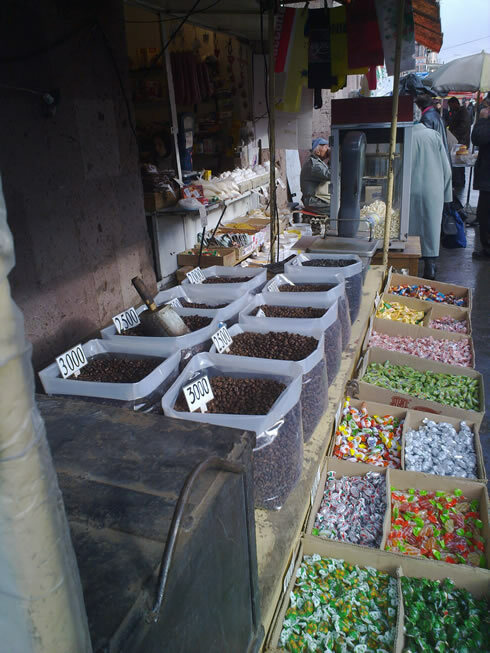 Food stores are piling up dried meats and candies on tables out front. 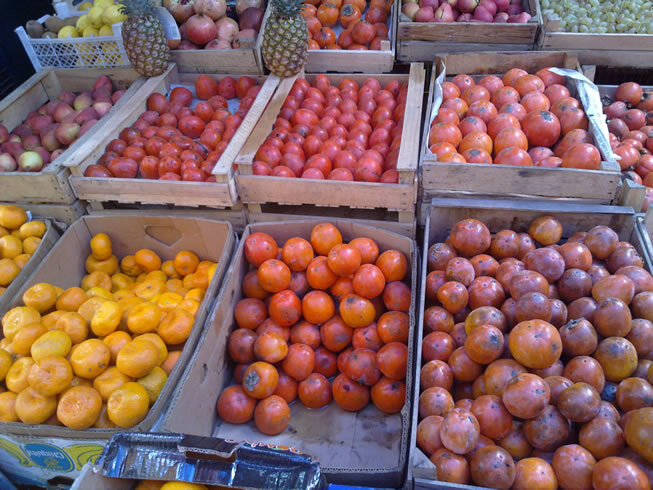 Fruit vendors are selling out their tangerines, persimmons and dried fruits as well as nuts. Now for the first time you can purchase Christmas ornaments and other assorted decorations for the home in small shops like those found in underground walkways. People do have money to spend it seems judging from the ample supplies on the marketplace, despite the financial crisis. It’s a good sign. 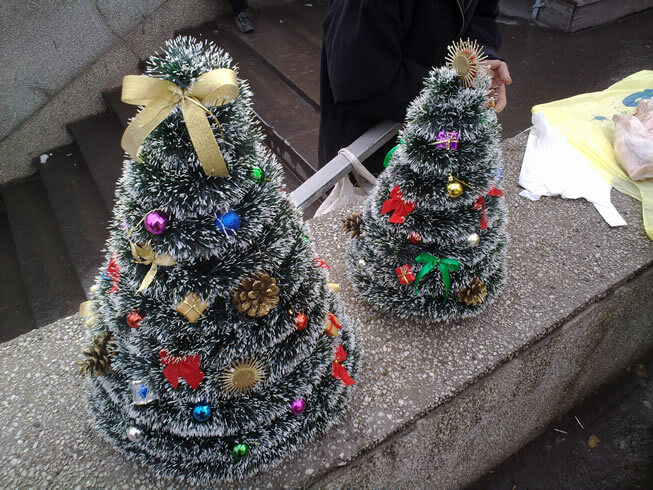 The New Year’s holidays are always enjoyable in Armenia because they serve as the means for bringing people together. Friends and family members that haven’t seen each other for months or perhaps years unite to bring in the new year while wishing each other health and happiness. Broken relationships are rekindled anew. It’s one continuous 10-day party, there’s always something to do and someone to see. The same doesn’t hold true for everyone, it’s true, but there is always hope that things will improve in the lives of so many who are deprived and destitute for whatever unfortunate reason. 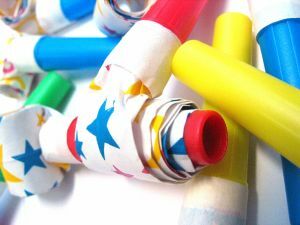 The holidays are a time of hope and peace, a time to reflect on the successes as well as failures of the months past, and how to build on them in the coming year. It’s a time to elevate aspirations and dreams. It’s a time to celebrate life. Have a happy and healthy New Year. Best of luck in the new decade. Housing evictions–most of which were totally unjust–are evidently continuing in downtown Yerevan. Quite honestly, I thought everyone living in housing built at the turn of the 20th century and even before was gone by now, but that’s clearly not the case. People have managed to hold on, despite the fact that ample compensation for their real estate is on hand. On December 9, employees of the CES (Compulsory Enforcement Service of Judicial Acts; an arm of the Ministry of Justice), invaded the home of one of the families residing at Buzand Street #83, threw them out into the street and proceeded to demolish the apartment. The CES employees had a writ to evict the Abrahamyan’s. The family has been paid compensation in the amount of 33 million AMD (about $86,000). The money is sitting in a government escrow account and can be withdrawn at any time. At first, the family was offered 36 million AMD for the 66 square meter house and the 78 square meter lot it sat on, but the Abrahamyan’s refused this initial offer. Afterwards, the “Bureau of Construction and Investment Program Implementation” (BCIPI) went to the courts, demanding that the property be registered as sold via compensation and that the residents be forcibly evicted, if necessary. Their suit was sustained. The evicted family, Viloleta Sahakyan, her daughter-in-law and four grandchildren now live with different relatives. “I have four children. We haven’t been able to all go to one house and be together. We’ve split up and I’ve been separated from my kids,” says Naira Abrahamyan. Her mother-in-law, Violeta, moved in with her other son also living at Buzand #83. The CES visited them on December 9 and wanted to demolish the place as well but they couldn’t since they didn’t have proper authorization. On the day we arrived, Violeta Sahakyan was moving stuff to her son’s home left at the neighbors. Her other daughter-in-law, Nuneh Hambardzumyan described how the BCIPI was able to obtain the property at Buzand #83 for businessman Hayk Beglaryan [son of noted businessman Barsegh Beglaryan, who owns the “Flash” chain of gas stations]. Every time I walk down Buzand and Aram Streets I feel depressed for the rest of the day. The shells of homes that were once standing are the eerie reminders of what Yerevan used to be. The unique architecture of these simple, yet graceful one or two-story structures and the narrow streets they were situated on made me fall in love with Yerevan, its quaint corners and nooks, its heart and hearth. Old Yerevan was beautiful, unlike anything you can find in any other major city; it was genuine, comforting and without pretense, it was the vibrant soul of the city, tucked away behind protective high-rise monolith slabs of concrete housing. And now it’s gone. Many of the homes looked solid enough, made from thick blocks of stone like tuf and basalt, as sturdy as churches were built centuries ago. But they are being torn down for the sake of “progress,” for greed at the expense of historical preservation. Even the building where Aram Manoogian, the leader of the first Armenian republic, lived hasn’t been spared–it’s located directly beside the SIL Plaza on the corner of Abovyan and Aram Streets (the later being named after Manoogian), and only the black stone facade is left intact, at least for the time being. If anything, that building should have been converted into one of several “home-museums” that you find throughout the city, but not this time. History matters very little to these businessmen-turned-government officials. The city’s past means nothing to them. Very little remains to show what Yerevan was like before 1918. Anyway, many families in those parts never received proper compensation during the last six years or so–they were cruelly thrown out onto the street penniless, and in some areas all you see are empty lots now, demonstrating that the evictions were indeed pointless. But the Abrahamyans at least are entitled to $86,000. That’s a good sum of money, arguably enough to buy a two-room apartment in Nor Nork (Masiv) and probably even a small private home in Malatia, perhaps with cash left over for furnishings. The price of real estate plummeted in 2009, so there should be quite a few bargains out there. Why don’t they take the cash and get as far away from the madness in downtown Yerevan as possible? Regardless, I think the government picked bad timing to evict this family, with the coming new year holidays especially. They should have waited anyway until they were able to find another place, it’s only fair. You can’t be expected to move out of your house until you have a new home ready and waiting, it’s common sense. But at least the Abrahamyans found temporary shelter. Now all they have to do is figure out where they’re going to permanently live. The Gomidas market is by far my favorite shopping place to buy fruits and vegetables. It has to be one of the most colorful markets that I have ever visited in Yerevan or anywhere in Armenia. The extraordinary colors and heavenly scents surround you, and it’s easy to get lost in the moment. Sometimes it’s hard to decide what to buy since everyone seems to be selling the same fruits–apples, pomegranates, pears, tangerines, pineapples–you name it. I visit there at least once a week to buy whatever I need, from dried herbs to persimmons. 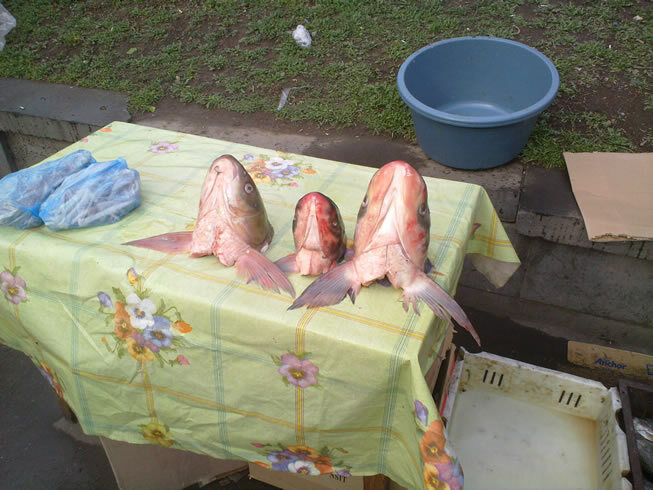 There’s also an ample supply of meats and fish as well–trout, sturgeon and carp are just some of the kinds of fish you can find being sold directly on the sidewalk. It makes walking a bit difficult for pedestrians but no one seems to mind. Commerce is conducted primarily behind the actual market which is perched high on a hill. Inside there are mostly dried fruit vendors, although one or two people sell dried meats and fresh homemade cheeses. 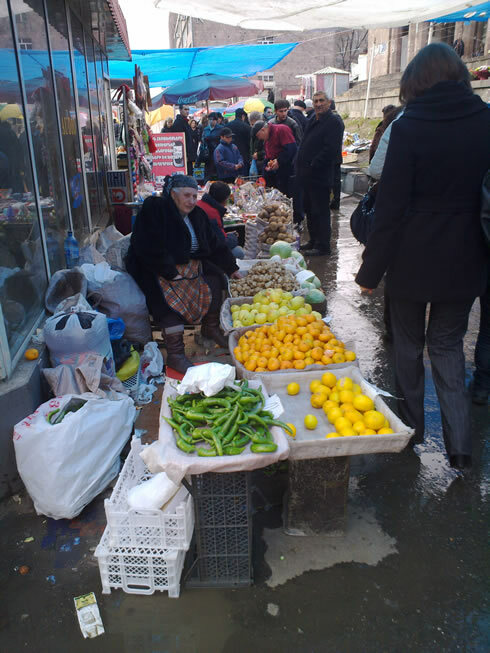 Nearly all of the vendors I have me are very friendly–there’s one woman from Gavar selling excellent potatoes who always greets me with kindness and warm wishes of health whenever I visit her to buy a few kilos. I try not to buy everything I need from one person to help out as many vendors as I can. None of them are making a huge profit–they’re lucky if they pocket 5,000 dram, or just over $13, at the end of the day. The Malatia and GOM markets are also lively but they are also fairly congested with shoppers, so I tend to stay away. 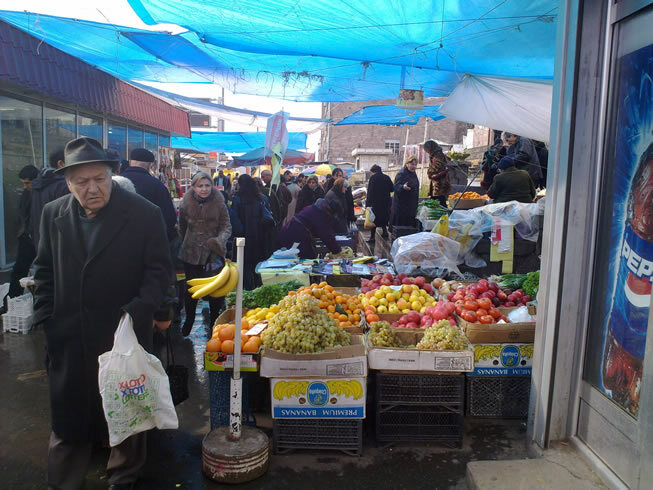 There’s a lovely small market adjacent to the central train station–you can buy superb lemons there shipped straight from Batumi at rock-bottom prices. I once bought a kilo of large lemons with relatively thin rinds–about eight of them–for 700 dram, or $1.85. You can’t go wrong. 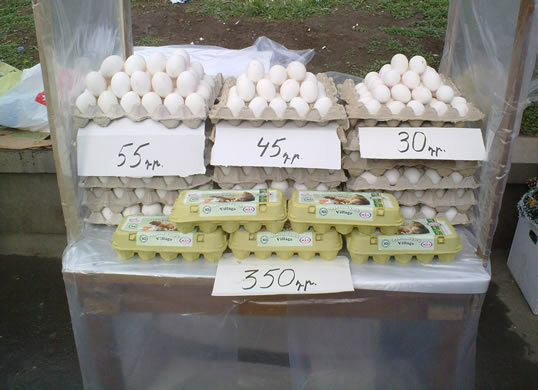 There’s nothing like shopping in a Yerevan open market. My friend Jason at Cicer et cetera published an entry a few days ago about a UNDP study that was conducted to evaluate where Armenia was heading on its current course of not adapting to the realities of climate change/global warming. Jason pointed out some very interesting information that is contained in the report. The study points out that climate change will have far-reaching effects on social and economic life, and the ability for people to adapt will depend on whether or not funding will be available to support adaptive policy measures and how quickly these policies can be implemented. “Armenia’s future economic development will depend on the decisions that the current generation makes about investments in adaptation [to climate change],” warns the report. On an optimistic note, the experts from the Stockholm Environment Institutepoint out that many of the best available climate adaptation policy measures can be important for Armenia’s economic development. These include improving water and power generation infrastructure, integrating climate adaptation in plans for economic development and energy production, planning for more efficient use of resources in the context of growth and higher rates of consumption, and considering the needs and vulnerabilities of rural and low income households. I’m hoping Armenia’s Ministry of Nature Protection, Ministry of Energy and Natural Resources, Ministry of Agriculture, Ministry of Transport and Communication and even the Ministry of Emergency Situations closely examines this study. Prime Minister Tigran Sarkisian seems to be a very capable, smart guy, so hopefully he will make sure the government does whatever necessary to curb the potentially devastating effects that global warming could have on Armenia. It may mean that some of their personal business interests will suffer, but that should be irrelevant when it comes to protecting Armenia’s ecological future. Let’s hope they all do the right thing. Why Don’t Armenians Like Trees? I’ve been disturbed for several years about the needless tree cutting that has been going on throughout Yerevan. Much of the time it’s being done by business owners. Tree cutting in and around Yerevan in the forms of pollarding and pruning have been going on for the last two decades. The Marash forest that blanketed the slope to the west of central Yerevan was completely felled in the 1990s when desperate people needed to keep their families warm during a time when there was barely any electricity or other sources of fuel to be had. But now, there’s really no excuse for cutting trees. Yet wherever you turn in this city, you’ll notice trees with branches lopped off them. Most of the time new shoots burst out from the trunk and in a few years they thicken. But some tree species that are sensitive to such drastic pruning measures simply dry out. 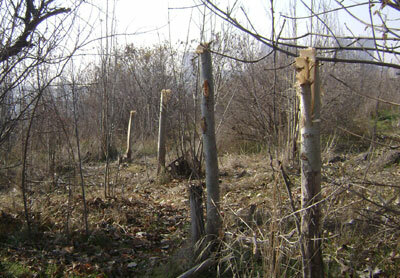 Municipal department heads have claimed on television and in print that annual pollarding is essential so that trees will not suffer from disease. Yet upon close inspection any passer by will notice that the branches are perfectly healthy. You don’t need to be an arbor specialist to realize that a tree shows no signs of decay when the pulp is white, wet and clean. This mentality is backwards anyway–you don’t need to and shouldn’t pollard as a method of disease control. Pollarding is only done in extreme cases and for only certain kinds of trees. Yerevan’s a dusty town, and trees are essential for helping to filter out the filth. They also beautify the city obviously, and the more the better. But trees are coming down left and right. There’s been some tree replanting going on, for instance in Republic Square, but there the unique (I don’t know the species), healthy trees were removed to be replaced by common acacia trees. A couple of the original trees remain in front of the Ministry of Foreign Affairs, though. Protests by environmental groups are falling on deaf ears, and even news articles aren’t having much of an impact in stopping the madness. The Northern Boulevard is completely devoid of trees, yet there are some decorative shrubs that could very well dry out in inclement weather (I believe some of them have already). Perhaps the underground garages there would interfere with the proper growth of tree root structures, which is the reason why they haven’t been planted. Or else, no one thought of it. Regardless, tree cutting for the sake of building new restaurants and cafes has to stop. When a member of parliament or someone close to government with lots of cash wants to build something, they chose their space and get to work, damn the trees and nature. It’s not clear what is being done with the branches, but something tells me it’s sold somewhere as firewood. There are too many construction projects being undergone in green spaces, and once opened they are far from being full of customers in the summer months. The question is: when are citizens going to put pressure on City Hall to halt the cutting?